I have finally got round to posting a WIP after a few week absence. This weeks' WIP is Lady Kina, the first top down that I have knitted for myself. It will be good to be able to get the length right as I can try it on as I go. I have left the sleeves on some scrap yarn as I'm not keen on cap sleeves so plan to see what yarn I have left then knit the sleeves to hopefully 3/4 length. I have already made a mistake by not reading the pattern correctly, ended up with 144 too many stitches, so my mistake is a design feature rather than a rip back! The yarn I am using is Sirdar Click Aran - 70% acrylic and 30% wool, it nice and soft, I've used this yarn previously and am happy with the results. I still have 3 hats to knit for the family, but they won't take that long to do. 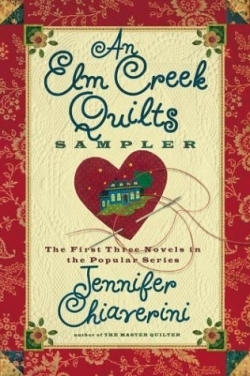 An Elm Creek Quilts Sampler - 3 stories in one for £1.00. I look forward to picking that up over the winter months. I see you are expanding your design career. Good for you! Ah, that yarn is like a rainbow but better! Also, go you for turning your mistake into something unique, that is really fun! It looks like a lovely yarn for a sweater. And those christmas hats looks awesome. You have been very busy knitting...I love the hat! !